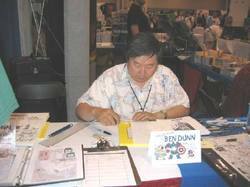 Ben Dunn was born in Taiwan on April 17, 1964. In 1985 he started Antarctic Press with MANGAZINE. A manga inspired comic book where he introduced TIGER-X, MIGHTY TINY, THE MAGICIAN and MESSERSCHMITT. In 1986 he debuted NINJA HIGH SCHOOL at Baycon. Ninja High School just celebrated it 20th anniversary and Antarctic Press is currently celebrating its 25th year in publication. Currently he is working on BOXCAR CHILDREN for Magic Wagon as well as a NINJA HIGH SCHOOL reboot. He also has a line HOW TO DRAW books and SARAH PALIN: ROGUE WARRIOR comic #1. Currently his portfolio can be seen at http://dogsupreme.deviantart.com or you can drop a line at www.antarctic-press.com.